Buccaneer outfit with hat, eye patch and earring. Made from 14 pt., high density, white paper board. Liquid laminated for a high gloss finish. Quick turn, just ask. 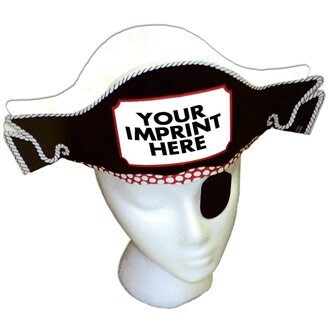 Your custom message or logo will sure to be noticed with large imprint area on the front of the hat! Includes preprinted stock graphics. shipped flat with minimal assembly required.